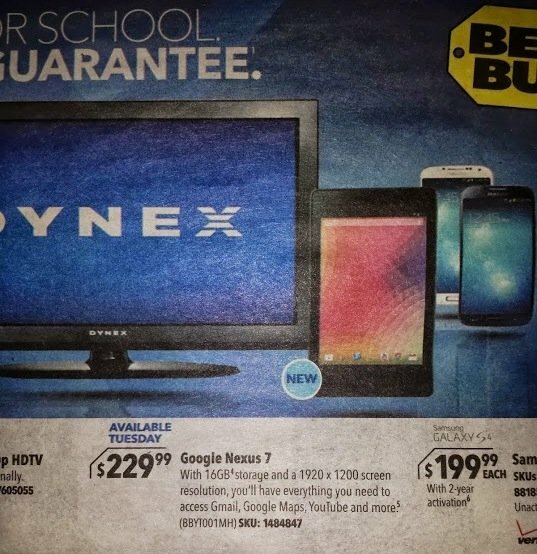 Everyone is excited about the coming Nexus 7 sequel, even Best Buy by the looks of this sales circular. We don't get a very good press image of the upcoming tablet, but we've seen that already so we can focus on the details instead. This ad mentions a 1920 x 1200 screen, 16GB of storage, and the same $230 price we reported last week. It's worth noting that it also says available Tuesday, but we have to remember there is a Tuesday in every week. This doesn't necessarily mean the day after tomorrow, and likely refers to Tuesday July 30, which is a few days after Google's big event in California coming this week. Without knowing the exact distribution date of this flyer, there is a bit of speculation involved. We're ready, and an appearance at Best Buy on release may mean a little less frustration than ordering from Google Play. We'll know in just a few days.